Pub on the High Street in Watford. According to the 2009 Good Beer Guide, it dates from the 16th century, making it the oldest licensed pub in Watford. Kake visited on a Thursday early evening in November 2008. There were four or five other people in, though there may have been a few more in the beer garden out the back. A few more customers trickled in around 5pm. Service was taciturn. It's quite cosy inside, with the drinking space wrapped around the narrow-fronted bar in the middle. There's a flatscreen mounted up by the ceiling in one corner towards the front, but it was switched off on my visit, and instead they had music (courtesy of Heart radio) playing on some rather crackly speakers. It seems to be a dog-friendly pub; there were two or three friendly and well-behaved dogs wandering around during my visit, soliciting attention from drinkers. 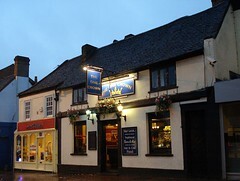 Real ales available were Tring Jack O'Legs (£2.70/pint), which according to the BITE comments linked below is the regular beer, and Triple fff Alton's Pride. A couple of signs warned that smoking on the pavement outside is not permitted; there's a beer garden out the back where you can smoke instead. The 2009 Good Beer Guide says there's a pool table, and sandwiches are available weekday lunchtimes. Accessibility: A couple of shallow steps up to get in; four deeper steps to get to the toilets and beer garden. Last visited by Kake, 13 November 2008. Last edited 2011-09-17 12:58:48 (version 4; diff). List all versions. Page last edited 2011-09-17 12:58:48 (version 4).